Most of us choose to remove DRM and convert M4V to MP4, a universal format. However, Apple TV, iPhone, iPad or other Apple devices may refuse to play MP4 video file because of incompatible codec. If you are in the "can't play MP4" category and need to convert MP4 to M4V for Apple TV, QuickTime, iPhone, iPad, you are in the right place. We cover most popular MP4 converting tools here, from free open source program to online tool, together with detailed steps on how to convert MP4 files to M4V. MacX Video Converter Pro is the professional MP4 to M4V video converter we high recommend here. 1. Convert MP4 format to M4V with at least 5x faster than Handbrake or other free tools, with the help of HT tech and hardware acceleration. 2. High Quality Engine built into the program helps the tool reserve nearly original quality. 3. 400+ preset profiles make it easy to directly convert MP4 to Apple TV, iPhone (X/8), iPad, Galaxy S8, Android/Windows mobile devices. 4. Built-in 370+ video/audio codecs, the video converter for Mac/Windows can convert among HD and SD videos, such as MKV to MP4, AVI to MOV, WMV to MOV, MKV to AVI etc. Step 1: Free download the program for Mac or for Windows and run it on your computer. Click Add File icon on the top-left corner and select MP4 video file to convert. Step 2: After the source MP4 video is loaded successfully, an Output Profile window will pop up, allowing you to select output format. Click Mac General Video, select "M4V Video (H264)", and click OK. Tips: The feature-rich software can also convert MKV to MP4, AVI to MP4, WMV to MOV, M4V to MOV, to name a few. Click setting icon to adjust video parameters, compress MP4 video before conversion, change video resolution/bitrate/frame rate etc. Click Edit to add SRT subtitles, crop, trim, split video into separate parts. Step 3: Click RUN button to start to convert MP4 videos to M4V on Mac or Windows. Handbrake is an open source M4V video converter for Mac/Windows/Linux you won't miss when it comes to convert video formats. However, you'll find no M4V output option on the Output Settings section. How do you transcode MP4 files to M4V free using Handbrake? The trick is that Handbrake can change .mp4 to .m4v extension when you pass-through AC3 audio. Use steps below to convert MP4 to M4V through Handbrake. Step 1: Free download Handbrake for Mac or Windows, and run it. Step 2: On the top-left corner, click File > Choose Source > File (Open a single video file) or Folder to select a single MP4 video file or a video file folder to convert to M4V. Step 3: Click Browse to select destination folder to save output file, then make sure the default container format is MP4 on the Output Settings. Step 4: Click Audio, and select "AC3 Passthru" on the Codec section. Handbrake will auto use the extension M4V when you pass-through AC3 audio. Step 5: Click Start Encode to encode MP4 format to M4V free with the free video converter for Mac/Windows. There are a number of good online converter programs to choose from, one of which is Convertio. It's clean and easy to learn how to get started. But the maximum file size for free account is only 100MB. If you want to convert large 4K UHD MP4 to M4V on Convertio, you'll get disappointing message - File is too large! To be able to convert bigger files, please select a premium service below. 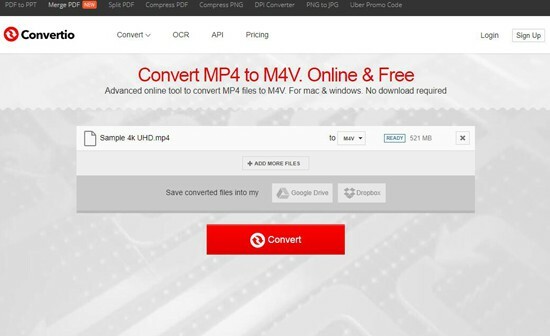 Use steps below to convert MP4 files to M4V online. Step 1: Go to the website of Convertio. Step 2: Select MP4 video file you'd like to convert from computer, Google Drive, Dropbox or video URL. It supports to convert online videos to MP4. Step 3: After the video is loaded, click icon next to "to", and select VIDEO, then choose M4V from the drop-down menu. Step 4: Choose to save converted M4V files from MP4 to Google Drive or Dropbox. 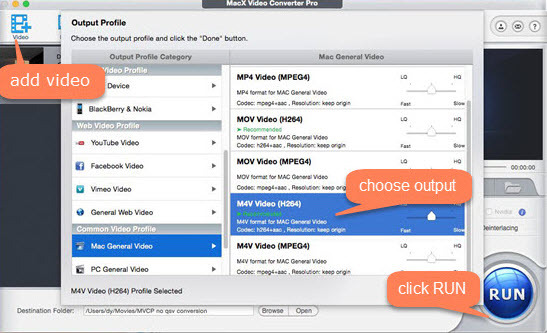 Step 5: Click "Convert" and start to convert M4V to MP4 online on Mac or Windows. It also works for M4V to AVI, M4V to MOV, MOV to WMV conversion etc. Can You Rename M4V to MP4? Can I change MP4 format to M4V manually by just changing the extension on Mac or Windows? I need to change an .mp4 (h264, AAC) to .m4v. Can I just rename it from x.mp4 to x.m4v. By renaming, I mean clicking on it in Finder on Mac or Explorer on Windows. Many users are wondering if they can just manually change the extension .mp4 to .m4v without using converters. MP4 vs M4V, they are exact the same, so you can manually change the file extension between .mp4 and m4v, and file are still playable. When you play these files on PC, remember to switch it back. However, only the file extension changes, not the codec. If the original MP4 is not playable on Apple devices due to codec incompatibility, this method won't help. Free download the best video converter for Mac/Windows to encode/decode MP4 to M4V, as well as MKV to MP4, AVI to MP4, AVCHD to iPhone, FLV to iPhone, YouTube to MP4/MP3, etc. Also a good video editor and compressor to split/trim/crop/rotate video, add subtitles, adjust video resolution, frame rate, bitrate, aspect ratio and other video parameters, etc. How to Convert MKV to M4V for iTunes, iPhone iPad etc.